BRAIN BOOSTER: Flaxseed is rich in omega-3 fatty acids. Specifically, it's high in a type of omega-3 called alpha-linolenic acid (ALA), which has been strongly linked to good brain health. With proper bowel movement and improvement in digestion, brain functions may become clearer and more efficient improving overall brain health. SUPPORTS WEIGHT LOSS: Psyllium husk is among the list of medicinal plants that have been shown to significantly decrease body weight. Psyllium husk can be very helpful in maintaining and achieving a healthy weight since it encourages a feeling of satiety when it is consumed. Psyllium husk is a great source of water-soluble fiber that expands to several times its original size when mixed with water. DIGESTION SYSTEM CLEANSE: Senna is commonly recommended for weight loss, since it can help to flush out excess toxins and residual waste matter in the colon and digestive tracts. If you are have constipation, bloating, cramping or indigestion, senna can often help by promoting the normal flow of food and waste matter through your bowels. Senna also can help to loosen up the stool and induce excretion. RESPIRATORY SYSTEM SUPPORT: Licorice is recommended to support respiratory system. Taking licorice as an oral supplement can help the body produce healthy mucus. The production of clean, healthy phlegm keeps the respiratory system functioning without old, sticky mucus clogging it. 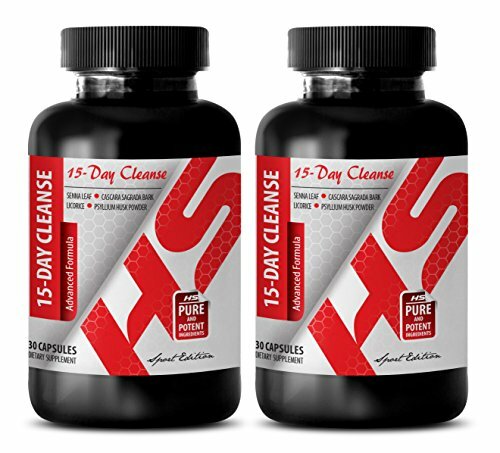 15 DAY CLEANSE: The purpose of the 15 Day Cleanse supplement is to naturally cleanse the systems of daily use. Our natural supplement include these ingredients: Senna Leaf, Cascara Sagrada Bark, Psyllium Husk Powder, Flaxseed Powder, Aloe Vera Gel, Lactobacillus Acidolphilus, Licorice Root, and Medium Chain Triglycerides oil. IMMUNE SYSTEM BOOST: Aloe vera possesses natural properties that may support the digestive and circulatory systems. Consumption of aloe vera results in better blood circulation and also improves overall health. When the blood is oxygen-rich, it automatically provides nutrients within the cells more proficiently. These healthy cells ensure your body's ability to ward off bacteria, thereby strengthening your immune system. SKIN & HAIR HEALTH SUPPORT: Flaxseeds benefits for hair include making it shinier, stronger and more resistant to damage. Flaxseed oil is another great option for your skin, nails, eyes and hair since it has an even higher concentration of healthy fats. Flaxseed is seen as beneficial for the skin and hair, able to improve its luster and shine. Modern research backs this claim, finding that the essential fatty acids in flaxseed indeed help promote hair, skin, and nail growth. ANTI-INFLAMMATORY: Aloe Vera is noted for its amazing anti-inflammatory properties that work instantly on the pain and swelling resulting from joint damage. Flaxseed is a great source of omega-3 fatty acids, preceded only by fish oil. Omega-3 fatty acid is the most active agent that fights inflammation. Alexandria Senna also soothes inflammation in the digestive tract. If you have any questions about this product by Healthy Supplements LLC, contact us by completing and submitting the form below. If you are looking for a specif part number, please include it with your message.